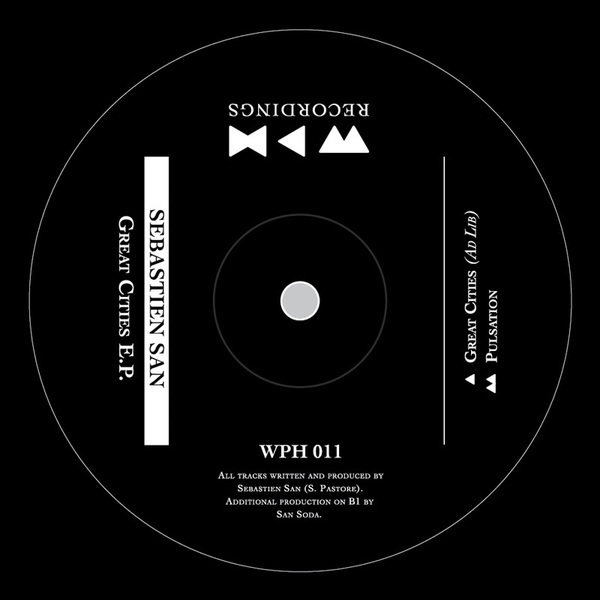 We Play House's 1st 2011 release is in session, featuring four tracks from Echocord and Planet E's Sebastian San plus a sparkling, downbeat and dubby remix by San Soda. Deeply inspired by Detroit, 'Great Cities' lives up to the elegance of his idols with sweeping strings, robust yet tender machine drums and infectiously loved-up piano chords. The beatless 'Ad Lib' is essentially Sebastien vibing on the strings and keys, while 'Pulsation' strips it all back for a lean and sophisticated groove. San Soda's remix gives a firm nod to Theo Parrish and 'Theories' comes with the melancholy but uplifting strings and flared synth vibes a la recent Carl Craig moves.